Traditional appointment with the fun Epiphany's Regatta. The most illustrious members of the “Canottieri Bucintoro” challenge each other hidden under wigs and crochet shawls. Departure from Magazzini del Sale at Zattere and arrival to Rialto. 8.30 am Dressing of Witches at the RSC Bucintoro at the Magazzini del Sale Zattere. 10.30 am arrival of the parade in Rialto, with musical entertainment and giant sock, playful display symbol of the event. 10.45 am public presentation of "maranteghe" and draw of the numbers of water. 11.15 am arrival in Rialto. 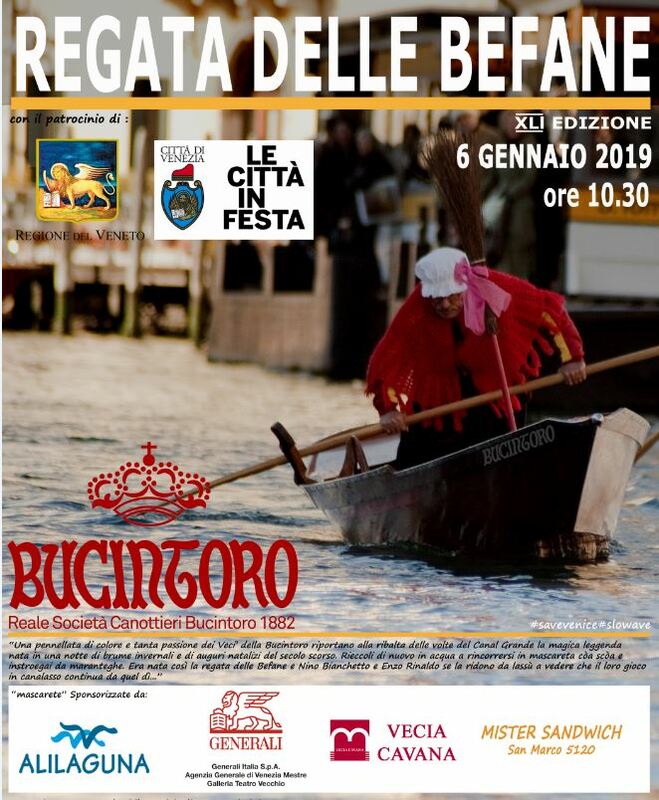 11.30 am Coronation of the "BEFANA 2019" and award ceremonies. In riva del Vin, at the foot of the Rialto bridge the PINK LIONESS IN VENICE offer treats and hot drinks to both adults and children.